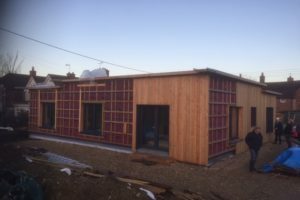 In December 2018 our group was invited by Andy Mackay (Mac Eye Projects) to visit a Passivhaus project that he was coming close to completing. We were fortunate in having the owner (Mick Woolley) present for our visit, so between Andy and Mick, we were giving an extensive and explanatory tour of this site near Stratford upon Avon. The only shame was that only three members of our group were able to visit. 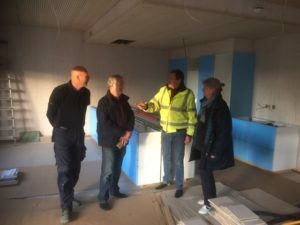 The photographs show Andy explaining the construction details to Carole Tracey, Ian Wood and Paul Williamson (Oxford region chair.). The CLT construction enabled this build to be easily project managed between Andy and Mick, with them both have plenty of hands-on involvement alongside overseeing sub-contractors. I was going to write a full report, but Mick kindly supplied the following, which gives a much better flavour of a true self builders experience and attention to detail. Mick has also provided links to the products he mentions. Thank you Mick. I am considering arranging another visit to Mick’s home in the spring, and will email the contact list once this is arranged. here are some notes about my build. Some links for products are at the end. I bought the plot for Larch Corner with an existing planning that proposed a timber clad single storey dwelling with a sedum green flat roof. The design was quite irregular in shape, though the architect had suggested this would be a Passivhaus. I spent some time working with Mark Siddall to turn the design into the present one, and Mark undertook all the PHPP details. The house sits on an XPS foundation. This is 260mm of Jackodur Atlas that provides both the formwork and insulation as an integrated whole. There is 200mm of concrete in ths. Overall, the foundation delivers a U value of 0.1. The wall structure is cross laminated timber (CLT), which provides the internal visual grade finish. This is 84mm Novatop SOLID. This is an excellent quality product that is edge glued and provides high levels of air tightness with minimal effort. As the CLT sections are large, the whole structure, including ceilings can be built very quickly, and we produced the structure in two days of erection with a crane. The ceiling is Novatop ELEMENT. This is a cassette type construction of 240mm depth that has built in insulation (Steico flex) and is again very airtight. My finished ceiling is an acoustic panel in timber called Novatop ACOUSTIC. The insulation structure for the walls is on the outside of the CLT. There are 360mm I joists, filled with Steico Zell blown insulation. The outside of the I joists has 80mm of Pavatex combi wood fibre insulation. Overall, this gives 0.1 U value. The roof cassette has a further 180mm insulation on the outside, using Pavatherm wood fibre, again giving 0.1 U value. The air tightness layer for the house is the outer face of the CLT. We taped all joints using Pro Clima Tescon Vana. The base tape to the concrete used Extoseal Encors. The roof cassettes had an airtight membrane (Pavatex DSB2) applied just after erecting the structure. This gave some weather resistance until the actual roof structure was complete. Over both roof and wall wood fibre we used Pavatex ADB as the weathertight membrane. We used grommets to aid air tightness, these are from green building store. I also found it useful to apply Tescon Orcon F, particularly sealing irregular and small gaps such as around wires. 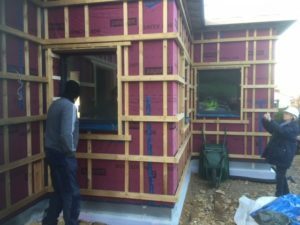 Overall, our first test for air tightness gave a surprising and highly satisfactory 0.08 result and we shall hope to check out our final result in the next month or so. My hot water is provided by an air source heat pump from Mitsubishi. This used a thermal store to provide both hot water and space heating (I have a small number of rads). The mechanical ventilation is a Paul Novus. I fitted the pipework myself, using a rigid galvanised ducting system. As a comment about my construction, I would say that using CLT gives a quick and reliable route to an airtight house. We taped joints, but Novatop tell me that they often achieve Passivhaus levels of air tightness simply by gluing the sections as they are joined. I would recommend having an edge glued product to ensure the CLT can be used as the airtight layer. I would also add that the XPS raft system is excellent and in my case using a pre-cut custom foundation slab made the construction extremely quick; we laid out the slab in about ten hours to get a very flat, accurate foundation. In the end it was cheaper than the more complex traditional strip foundation approach. On the ducting, I would say it would definitely be worth getting bespoke fittings to clip the ducting in place, as the suggested approach by Green Building Store is somewhat Heath Robinson and quite slow (though giving an acceptable result). This entry was posted on Thursday, January 17th, 2019 at 9:22 am	and is filed under AECB general news, AECB Latest News. You can follow any responses to this entry through the RSS 2.0 feed. Both comments and pings are currently closed.